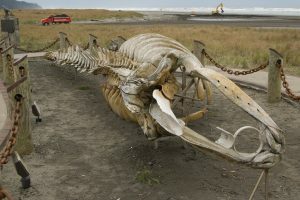 Gray whales, also known as the grey whale, Pacific gray whale, California gray whale, gray back whale, and devil fish (by whalers) are a large baleen whale found in the Pacific Ocean. Size: Full grown gray whales can measure 43-49 ft (13-15 m), while newborns are around 16 ft (4.9 m) in length. Weight: Adults can weigh up to 40 tons (44 short tons), but they usually range between 15 and 33 tons (17-36 short tons). Color: They are light to dark gray with a mottled appearance, with patches of gray-white scars left by whale lice. Their baleen is off-white, cream or blond. Sexual Dimorphism: Females are larger than males. 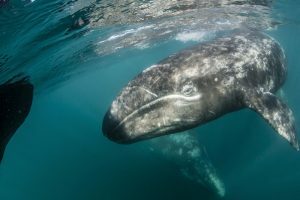 One of the two populations of gray whales is found along the Pacific coast of North America from Baja California to the Chukchi and Bering seas, while the other lives in the waters of the Western Pacific from the Sea of Okhotsk to South Korea. 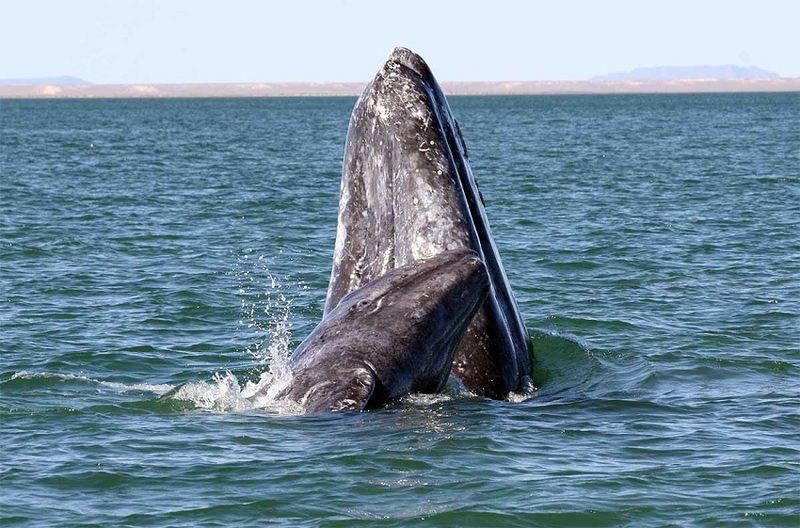 The feeding waters for gray whales are coastal areas with sandy or muddy bottoms. These whales are migratory and travel one of the longest distances among mammals, sometimes up to 12,675 miles. The migration season for the Eastern Pacific population starts in October and ends with them returning to the northern waters around April. 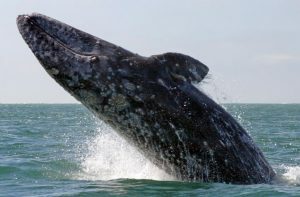 Like many other whale species, gray whales also practice breaching, wherein they jump out of the water into the air, before splashing back down again on their side or back. Their breathing patterns are rather predictable, exhaling 3-5 times from their blowhole at intervals of 15-30 seconds. Before a dive, they raise their tail flukes above the surface of the water and can stay submerged for up to 15 minutes. They are filter feeders, otherwise known as mysticetes. They dive down to the bottom and fill their mouth with sediment before forcing the sediment through the baleens. They trap a large number of crustaceans, notably amphipods, ghost shrimp, in addition to polychaete worms and herring eggs. 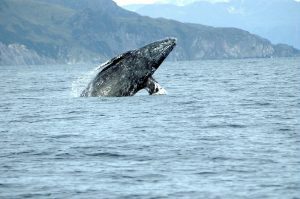 Gray whales can engage in sexual activity at any time of the year, but peaks have been observed during their migration towards the south. Little else is known about the mating behavior other than the fact they partake in group mating events. The gestation period lasts for around 13½ months after which a single calf is born. Calves are born smooth, unlike the scarred appearance of the adults. They are nursed for up to 7 months. Mothers are fiercely defensive of their young. Both genders reach sexual maturity at around 8 years of age. They live for around 55 to 70 years. Gray whales use echolocation to communicate with each other. They also use an array of moans and short pulses, the latter of which aids in echolocation. The baleen of the gray whale helps them in filtering out food from the water by skim-feeding. The shape of their body helps in swimming with speed. 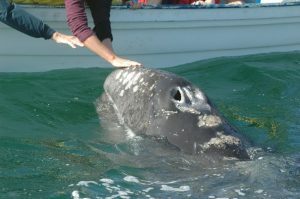 The gray whale’s skin secrets small droplets of an oily substance which also helps reduce drag and increase speed. Their muscles have a high amount the protein, myoglobin. This stores oxygen, in turn, helping the whale to stay submerged for longer durations. When underwater, their heart rate slows down by almost 50%, thus conserving oxygen and extending dive times. The specially adapted bone structure helps the gray whale to be buoyant. Their kidneys are capable of getting rid of the excess salt they take in from the sea water. 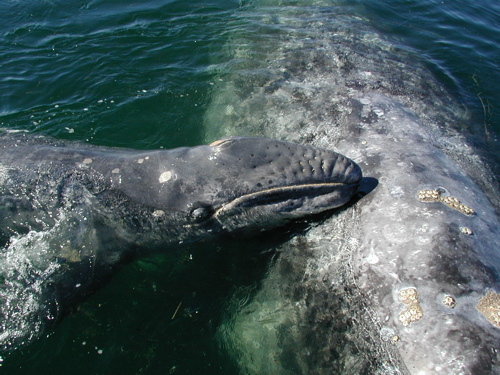 The thick blubber of the gray whale keeps this marine mammal insulated in the freezing waters they inhabit. The blubber also helps in keeping this whale buoyant. Killer whales (orcas) are the only predator of the gray whales. Particularly vulnerable are the calves during migration. 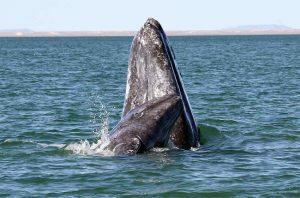 The IUCN has listed the gray whale under its ‘Least Concern’ category. The gray whale also inhabited the Atlantic Ocean but became extinct towards the end of the 17th the beginning of the 18th In 2010, however, a gray whale was seen off the Israeli Mediterranean coast, leading many to think that they were repopulating their century old breeding waters. 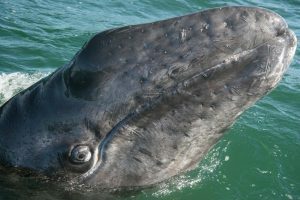 Further, in 2013, a gray whale was seen off the coast of Namibia in the first instance of these marine mammals being spotted in the Southern Hemisphere. Being a coastal species, these whales often come to within an arm’s length to whale watchers off the Pacific coast of the US. They have two blowholes, creating a heart-shaped blow on a calm wind day.